In a letter addressed to Tim Cook today, activist investor Carl Icahn praises Apple for its innovation, while again asking the company to accelerate its stock repurchase program. Icahn previously pressured Apple to increase its stock buyback program to as much as $150 billion, but dropped that bid following Apple's decision to repurchase $14 billion shares in February of this year. Icahn continues to note that Apple is "dramatically undervalued in today’s market" with its shares trading at half of Icahn's estimated $203 value. This valuation is likely to change as Apple's new product lineup chips away at Android's market share. While we recognize and applaud the company’s previously increased share repurchase authorization, we ask you to consider our advice once again (to the benefit of all shareholders) and consider accelerating share repurchases again via a tender offer. Our valuation analysis tells us that Apple should trade at $203 per share today, and we believe the disconnect between that price and today’s price reflects an undervaluation anomaly that will soon disappear. Icahn calls Apple's new iPhone models "best in class" and applauds Apple for growing its mobile ecosystem of services that surround the handset, including Apple Pay, HealthKit, and more. Beyond simple price comparison, we see the iPhone as best in class, supported by expert reviews and by the lines of people all over the world waiting to buy it. Perhaps most importantly, we believe the iPhone will take market share because its merits are no longer viewed in isolation from the overall Apple ecosystem of products and services, which include iOS, iPad, Mac, Apps, App Store, iCloud, iTunes, and (more recently) Apple Watch, Apple Pay, Home, Health, Continuity, Beats. With the iPhone as the foundation, Apple’s ecosystem has come to play an important role in the daily life of Apple users, and while Apple continues to make impressive strides to improve it, the competition falls behind in what is arguably the most important race of this technological era. For its part, Apple has acknowledged Icahn's letter but given no indication on its plans for the future beyond its current policy of reviewing the capital return program on an annual basis. We always appreciate hearing from our shareholders. Since 2013 we've been aggressively executing the largest capital return program in corporate history. As we've said before, we will review the program annually and take into account the input from all of our shareholders. Icahn disclosed last year that his holding company had taken a large position in Apple with Icahn now owning 53 million shares of AAPL. Icahn's note follows Apple's April announcement of an increased stock repurchase program that authorizes the purchase of up to $90 billion in stock and a 7:1 stock split that was instituted in June 2014. As part of its capital return program, Apple pledged to return more than $130 billion to shareholders by the end of 2015. Oh this guy again. Trying to manipulate the market again. Eugh. Can't stand this guy. He's a microcosm for everything cancerous about Western civilisation. "Accelerate the repurchasing of your stock to drive the price up faster so I can sell my shares faster and make my $ faster. I really don't care about the company's long term prospects"
Every one of his pictures makes me want to punch this guy in the face. So tired of hearing about this bullying prig. I have to say I agree with Icahn. Apple seems undervalued to me. The iPhone is the best in class and I agree that the smartphone market is the most important piece of technology. I also think that Apple is dominating that market and will continue to do and its dominance is on the the assent. Icahn has been right about these stock buy backs for years now. Apple and their shareholders would have gotten a fantastic return if Apple had followed his advice more whole heartedly over the last few years. Now Apple has a continuing growing stockpile. The supper successful iPhone launch (one in which people are not recognizing will include sales at a much higher price point and probably higher margins (more people will buy the 64 GB 6 and the 6+, then in the 5s launch where the most common phone sold was probably the 16gb version)) is going to add tens of billions to this cash pile over the next two quarters. This isn't a popular opinion around here, but shareholders own the company. Apple is worth more than 610 billion dollars. They're virtually printing money, and their future growth is going to be incredible. He's doing a good thing in the long run - with more value in the company, Apple can purchase more/larger corporations. When a company buys another, it's rarely done in terms of cash. It's done in stock. Under Icahn's projections, Apple would be worth over 1.4 Trillion dollars. That would allow them to acquire really, really big name players. And here I was thinking I'd have a good day. That mug can ruin anyone's mood. This guy is so shifty!!!! Did you guys read his letter? He is totally right, Apple has been held back. Bendgate and all this nonsense for years. Interest rates are so low, Apple's best investment is to buy it's own stock. And they are doing that. 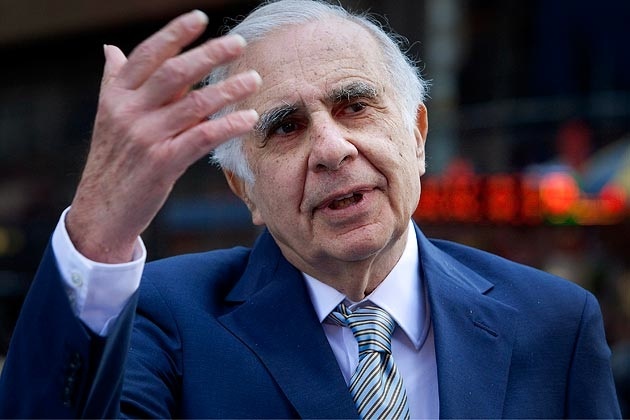 Why so negative on Carl Icahn?